Wow…..yesterday my Seattle gallery sold a painting to a music producer in Tokyo. What a great feeling to think that one of my paintings is flying over the Pacific right now and will make its home on a wall in Japan….and on the cover of a music CD. It’s been a slow week for art making due to the death of my father-in-law. It’s so sad and we’ll all miss him so much. I’ve also packed up and shipped out two more boxes of paintings to Louisiana…but this time some works on paper. That will be a new one for this gallery as they’ve always wanted the large canvases. Hope it goes well for their big anniversary in a couple of months. I did get into the studio some though. I’d been mulling around in my mind for some time a painting that I was never really satisfied with. SO that sucker is now painted over. AND, it was so good that it was red. I LOVE red, maybe too much sometime. I don’t want it to be a crutch to have red in its various multitude of values and intensities under ALL my paintings. So far, this new incarnation is very red as well but totally different than the other one. My order for ten new large canvases barely made it in under the wire. I picked them up Friday before they closed. I am so lucky to have a canvas manufacturer right here in town….saves me a ton on shipping costs. I have to have a good assortment of sizes for the Mississippi Art Colony session next week. Guess I better decide what I’m taking as I only have tomorrow and Monday to pack it all up. The visiting artist this session is Randall LaGro from Taos. Looks like this could be another great colony. Opening reception went great for the NAWA Invitational show, Landscapes, that opened Saturday night. There were four artists from the group there to say a few words about their work. There was a surprise for me walking into the museum……a podium had been set up on the raised stage at the back of the east gallery where the show hung. I’d not thought of the “art talk” as being so formal, but we muddled on through. In fact, it turned out quite well. I’m happy I didn’t know or I’d have been nervous. This week I’m taking time off for family time. Although you know it’s coming some day for the aging members of the family, you still aren’t prepared for the death of a loved one. 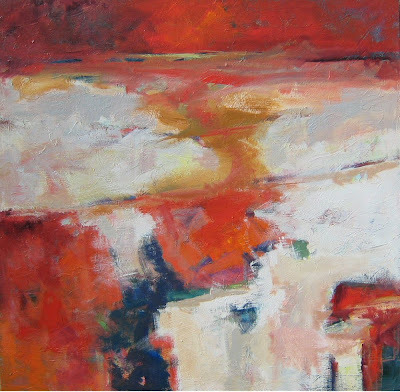 If I’m able to make it to Mississippi Art Colony next week……….it will be back to painting and a few blog entries. 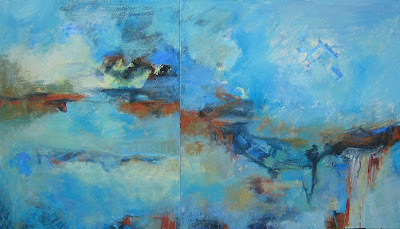 ..The National Association of Women Artists Invitational, “Landscapes“. The show will open with a short gallery talk at 6:30 pm this Saturday, September 15 ( I think I’m introducing the speaker, but this is kinda ad lib here and casual). It will be at my local art museum, the Longview Museum of Fine Arts, 215 E. Tyler St., Longview, TX. I’m feeling slightly guilty that I haven’t done more work with this show, but I did get it set up with the museum two years ago and waited for them to need a little help. Looks like they didn’t need much as the museum and NAWA organization got it all together without much from me. Good thing, too, as this week I’ve had tonsillitis and a little under the weather for a couple of days. I’ve been a member of this organization since about 1998 according to my records. It’s afforded me the opportunity to show my work at venues I’d never known about if I was not a member. Some were art galleries, or museums or art centers. 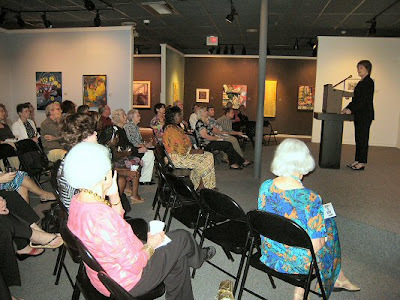 The NAWA is the largest and oldest association of women artists in the US. 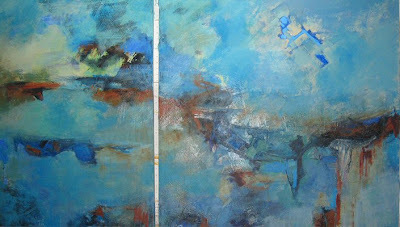 I will have two paintings in this show…….Beyond My Walls and Summer’s End 1. If you are around the Longview TX area through October 27, please come by and see the show. I laid in more layers as mentioned previously with the intent to then partially obliterate that layer beneath the final one. It took a couple of days of mulling to finally get out the big brushes and paint but I think this will do it. I took this picture outside but the light came and went so more documentation will have to follow if this is the final rendition. Sometimes, I find teensy little places of uncomfortable spots to rectify once I think the painting is finished but I doubt this does that much for the final effect. I don’t think this one will get any of that. Here’s the intermediate step (lower photo)and the final version. Waiting for Paint to Dry! Everyone’s heard of “waiting for paint to dry”. Well, sometimes I do that a lot. Good thing I use acrylic or in my old age, I’d forget what I had in mind by the time I got back to it. I have found in my painting process evolution, that I spend more time laying down paint and waiting for it to dry, then staring at it for a long time, then waiting some more, than I do actually painting. I have to add all this paint so that I can then later cover it up. At least part of it is covered up. Gotta keep it simple, with interest when you get up close. If I don’t do this, I don’t like what I get for a surface. I will admit that if the painting isn’t too large I can “sometimes” get a painting I like alla prima, but not often. These paintings are just gifts. The others have to be worked for, not so much physically as mentally.